If you've been diagnosed with gestational diabetes - a particular form of diabetes you can develop in pregnancy, even if you have no previous history of the disease - you'll probably wonder at some point if you can ever enjoy a cake or dessert or piece of chocolate again - or at least until your baby is born when gestational diabetes disappears. The answer, luckily, is yes - there are plenty of desserts you can enjoy. And I don't just mean sugar-free jelly or no added sugar Angel Delight, which seem to be staples of the gestational diabetes (GD) diet for a lot of people- if you enjoy baking, or eating things that other people have baked, there are still options out there, even though you should be avoiding sugar and refined white carbs, which unfortunately includes the flour usually used in cakes and biscuits. There are alternatives - for instance sweetener instead of sugar, and ground almonds to replace flour - and I'm going to point you in the direction of a website that has some great recipes. Very soon after being diagnosed with gestational diabetes I found a Facebook support group that was linked to a website called GestationalDiabetes UK. It’s full of incredibly helpful information, birth stories, meal plans and recipes. It was set up by a mum who had gestational diabetes and couldn’t find enough information or support. She’s done a lot of research and has worked with various organisations including BabyCentre UK which advertises her site as somewhere to go for support with GD – so while she’s not a medical professional, I felt like I could trust the info on her site. The main reason I used the site itself – rather than the Facebook group, where I often posted questions or comments for advice or support – was for recipes. I found it relatively easy to design my own meal plans but when it came to something sweet, I really struggled. Diabetic cakes often use sweetener instead of sugar but with GD, as I mentioned above, I was advised to cut down on carbs and particularly refined white carbs – meaning cakes or desserts made with plain or standard self-raising flour were out. Members of the GD UK Mums Facebook group were raving about the chocolate brownies so I had to give them a go. The website has a lot of free recipes but to get this particular one you'd need to sign up as a member, which costs £7 a month (there is a cheaper option but that doesn't include access to the recipes) - you can cancel any time so I was a member for a couple of months while I was pregnant. 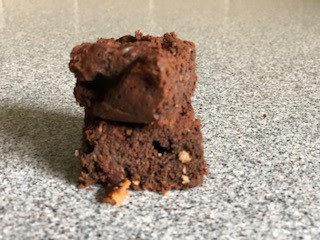 So obviously I'm not going to give you the recipe for the brownies and advise you to sign up for the site even if just for a month, but like many other diabetic friendly bakes, you won't be surprised to find that the flour is largely replaced by ground almonds. I found this gave the brownies a slightly grainy texture; they don't taste of almonds and just taste of chocolate. The ultimate test was my husband who loves chocolate brownies and doesn't like nuts, and he enjoyed these! I did find them a little more dry than I would have liked, with a more cake-like texture than other homemade chocolate brownies which are usually more gooey, but they were a really nice treat if you are missing chocolate cake and brownies!